Dr. Bonner has chosen the best titles from the following publishers to share with you: Alfred, Beckenhorst Press, Brookfield Press, Daybreak, Fred Bock, Hal Leonard, Hope, H.W. Gray, Jubilate Music, Lifeway, Lillenas, Lawson-Gould, Praisegathering Praise Song, Shawnee Press, Word Music and others. 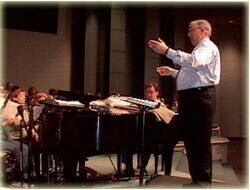 Dr. Gary Bonner, former Dean of the School of Music at California Baptist University, is an internationally recognized conductor and trainer of conductors. He provides Choir Workshops and offers Conducting Seminars at which he has trained over 800 conductors from across the nation and world. Dr. Judd Bonner is former Dean and Professor of Advanced Conducting and Master's Conducting I and II at California Baptist University. event, please click the button below.